This list needs no explanation, what with Christmas and Hanukkah being just over 2 weeks away, so I’ll keep this short and sweet. Over the last couple of years I’ve seen, again and again, how much everyone enjoys grain free cookies, not just people who follow a gluten free or paleo diet. So I stopped making two batches of cookies, and for the last couple of years, I’ve made an entirely grain-free repertoire. So, don’t be afraid to do the same. You should be able to eat every single kind of cookie that you put the time and energy into baking! 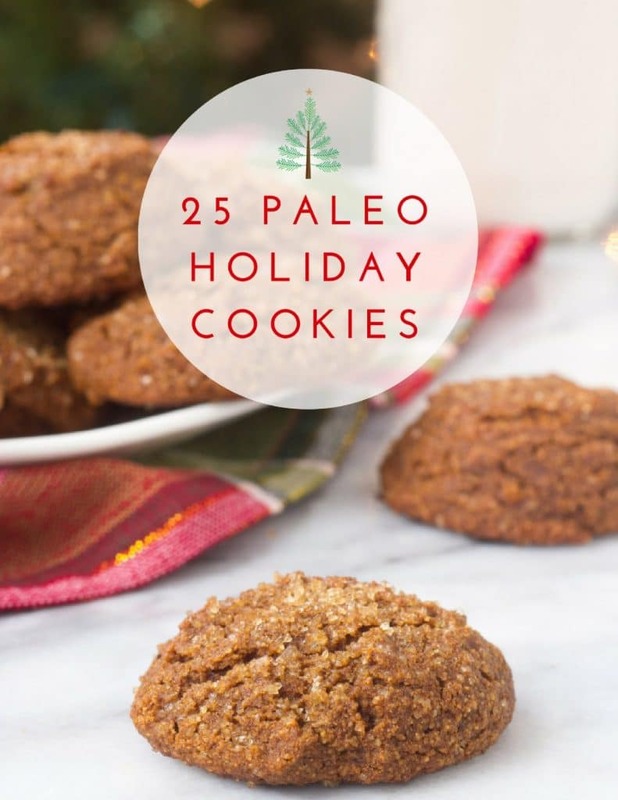 There are plenty of options out there, of course, but here are 25 of my favorite gluten free and grain free cookie recipes. If I’ve missed any that you have tried and loved, please leave me a link in the comments below! What a great roundup! Thank you so much for including my lemon olive oil cookies. I can’t wait to try your dark chocolate peppermint brownies! Thanks! And you’re welcome 🙂 Let me know what you think of the brownies! Thank you for including this round-up!! I have so many pinned recipes, but sometimes, it helps to start fresh when I’m thinking about what I want to make this year 🙂 I also use Elana’s Pantry “Mexican Wedding Cookies.” It’s a classic recipe that tastes delicious – It tastes just like my grandma’s non-paleo version! You’re welcome! I feel the same way. Sometimes you just have to streamline, you know? Oh, Pinterest! I’ll check out that Elana’s Pantry recipe for sure! Thanks for the recco!